In February 2010, Viktor Yanukovych became the president of Ukraine after defeating Yulia Tymoshenko in the second round of elections. (In Ukraine, if no candidate gains over 50% of the vote in the first round, the two leaders go into a one-on-one second round). Yanukovych obtained 48% of the vote, versus 45% for Tymoshenko. The close relations of Tymoshenko and Vladimir Putin are well known in Ukraine. In fact, Tymoshenko’s imprisonment — which was one of the few deeds of the Yanukovych regime that the vast majority of Ukrainians, and especially Ukrainian nationalists supported — was vehemently opposed by not only the West, but Russia as well. It was Tymoshenko that essentially sold out Ukraine to Russia with highly corrupt gas-deals while she was prime-minister — actually one of the reasons she was sent to prison. It was because of these deals that nationalists urged voting against both candidates leading up to the elections in 2010. Overall, the most influential oligarchs in Ukraine supported Yanukovych — often the deciding factor in Ukrainian elections. It’s worth also noting that, indeed, Eastern Ukraine gave Yanukovych an absolute majority, whereas Tymoshenko gained the support of the vast majority of western Ukraine (despite being herself a Russian-speaker from Eastern Ukraine). This is largely due not to separate views on Ukraine but internal battles between oligarchs, who largely control media and business in their respective regions. In both regions, the oligarchs are usually not ethnic Ukrainian, nor ethnic Russian, and quite often switch sides, but that is another topic for another day. Indeed, on the most important internal questions that the Western and Russian media claim “divide” Ukraine, we see strong national unity. For instance, in terms of making Russian a second state language, only 4% of the population views this as an important problem, while only 28% supportthe initiative. Of the 28% who support the initiative, again, we see division on ethnic lines, with the vast majority of ethnic Russians supporting the initiative, with the vast majority of ethnic Ukrainians opposing it. The Yanukovych period was one of intense political corruption in which his family members illegally obtained billions of dollars of wealth. Ordinary people were terrorized by the so-called “family” (denoting Yanukovych and his close associates with their mafia) for four years in all parts of Ukraine. This period was also one of a complete selling out of Ukraine — primarily to the West. After seeing a vast improvement during the presidency of Leonid Kuchma (mid 90s–2005) and stagnation during the presidency of Victor Yushchenko (2005–2010), living conditions started to decline. By 2014, support for Yanukovych dwindled as the vast majority of the population had had enough. Comparing Yanukvoych to Assad or Milosevic is quite inappropriate i— most of all, because Yanukovych was largely pro-Western and did nothing to protect his own population. It was his regime that allowed Israel to kidnap Hamas engineer and key political figure Dirar Abu Sisi, who had found refuge in Ukraine, and bring him back to Israel. It was Yanukovych who, for a pittance, gave America all of Ukraine’s enriched uranium and continued the destruction of the remains of Ukraine’s once powerful army. It was the regime of Yanukoych that held the first government-sanctioned gay pride parade in Ukraine, which was held in complete secrecy under intense security, yet was covered, defended and promoted afterwards by all state media and media loyal to his clan (who, unlike the population, knew where and when it was happening). It was Yanukovych and his government who most heavily lobbied to sell Ukraine out to American corporations and have Ukrainian land and ecology essentially destroyed by fracking in search for shale gas. It was American political scientists who were hired by Yanukovych to help him gain the presidency and American lobbyists that worked for him in Washington. These are a few of many examples. Incidentally, regarding fracking and shale gas, Russia vehemently opposes the spreading of shale gas as it is a direct threat to Gazprom. Yanukovych, his clan, and virtually all of the pro-government media in Ukraine constantly painted anyone who dared to oppose shale gas research in Ukraine as someone who was paid and hired by Gazprom. However, fracking and searching for shale gas in Ukraine was also vehemently opposed by Ukrainian nationalists. The system responded by painting Ukrainian nationalists as Russian agents. Aside from nationalists, who were most staunchly against it, the opposition also opposed it. 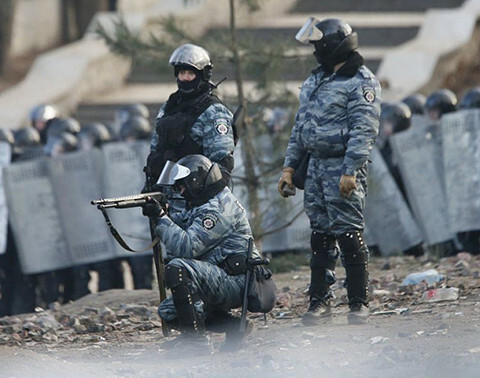 Regarding the first gay pride parade, it was the Berkut unit of the national police — the same unit that protestors fought during the Maidan during protests — that beat without mercy all protestors, especially nationalists, but also many older Christians, who had found out where the parade was going to be held. When one understands this, it becomes clear why many Ukrainian nationalists view those Western “nationalists” and “traditionalists” who sang odes to Berkut (one can find such groups on Facebook) as being nothing short of schizophrenic. There is no logical reason why the West would even slightly oppose Yanukovych. He was the most loyal leader Ukraine had ever had to the West. He was more pro-Western than many leaders of countries inside the EU. The protests on the Maidan originally started in mid-November 2013 after the Yankovych government refused to sign an association agreement with the EU at a special summit. A few years ago, no one in Ukraine cared about the association agreement with the EU at all. The agreement was largely ignored by the vast majority of the population. Nothing was known about it. It should also be noted that this is not the same as membership; the same agreement was signed by Syria, Saudi Arabia, Israel and many other non-European countries. This changed around a year after Yanukovych became president, when the media and Yanukovych himself started promoting the agreement as the solution to all of Ukraine’s problems. Whoever opposed it or any part of it was against Ukraine, according to its backers. Parenthetically, it was the Yanukovych government that first, under the pretext of the agreement, tried to incorporate homosexual propaganda into Ukraine’s laws — banning “discrimination against homosexuals,” as well as promoting numerous other anti-family initiatives. This was vehemently opposed by nationalists, as well as cautiously opposed by the opposition. According to propaganda spread by the media in Ukraine, however, nationalists and the opposition opposed such initiatives because they were against Ukraine’s progress and against the signing of this “holy” agreement. Thankfully, this initiative was eventually defeated after wide protest. Needless to say, thanks to Yanukovych and his efforts, in all parts of the country support for the agreement increased. It is logical, then that there was disappointment when Yanukovych suddenly decided not to sign the agreement without any warning. (Note: it was later found out that the agreement was not signed due to extremely unfavorable conditions for certain Ukrainian industries. The government that came to power after Yanukovych also refused to sign the same agreement until those conditions were changed). This disappointment, however, was nowhere near enough to cause mass social unrest. When news that the agreement was not signed became widely known, nothing happened in any region of the country. Many might have been disappointed, but no one really cared. The only protest was one with perhaps a few dozen people, or maybe a hundred at most in downtown Kyiv on the Maidan. Such protests take place in Ukraine every day. The protest was not covered by the media and no one paid much attention to it. That is, no one paid much attention until they found out that, for unknown reasons, police used extreme force to disperse the protestors. Illogical force. The protestors would have dispersed quietly in an hour or two without anyone ever knowing something took place. The next night, more people went to protest, but this time against the police. During this protest, there were more cameras present. Extreme force was again used for no apparently reason. ( Note: it was later discovered that this was because of internal fighting in Yanukovych’s clan, as the move was ordered by someone close to Yanukovych named Sergei Lyovochkin in an attempt to force the Minister of Internal Affairs into retirement.) In any case, news and videos came of young students and old pensioners being brutally beaten. This was the final straw. The Maidan had officially started and mass opposition to the Yanukovych government had finally reached its boiling point. Thus, the Maidan did not start as a pro-EU protest, as Russian and Western media claim, but a protest against the government and police. Taking a step back, it’s important to understand what exactly it means to be pro-Russian or pro-EU in Ukraine, as this is extremely poorly understood from outside of the country. Regarding the EU, it’s important to understand that being pro-EU in Ukraine has a completely different meaning than it appears from the West. In Ukraine, there are no liberal politicians in the Western sense of the word. Amongst the average person being pro-EU has absolutely no ideological connotation. I personally know people who spread the Protocols of the Elders of Zion and consider themselves traditionalists but support the EU, and very liberal people who vehemently oppose the EU. The EU in Ukraine is viewed exclusively in economic terms. Those who support the EU support it because they think that it will immediately end corruption in Ukraine, improve roads, increase wages, and in general simply make life better. I cannot reiterate enough that in Ukraine, in terms of ideology, support for the EU means less than nothing. It is all about economics and living conditions. Many think joining the EU will indeed end corruption in Ukraine and result in better living conditions. They do not see the EU as favoring large non-White immigration and the end of a strong sense of national identity. Being pro-Russian in Ukraine also does not have many ideologically connotations. In the direct sense of the word, usually only ethnic Russians, as well as older people who lived most of their lives in the Soviet Union, are pro-Russian. One should understand that contrary to what is sometimes claimed in the West (probably to simplify a complex reality), politicians like Yanukovych did not campaign on a pro-Russian platform, and his party does not advocate a pro-Russian platform. Rather, certain elements were added (like support for the Russian language) to garner support from this segment of society. This was quite effective. In general, pro-Russian forces in Ukraine view Ukrainian nationalists as their main enemy — not Americans, nor anything Western. This becomes evident when one looks at the conduct of this group, as described in detail below. It should also be mentioned that being pro-Russian and pro-EU in Ukraine is far from being mutually exclusive. Quite the opposite: the regional language laws, described above and supported by pro-Russian politicians from the Communist party — laws that clearly had an anti-Ukrainian undertone —were justified as being good because “they’re like that in the EU” where multiculturalism rules. Overall, staunchly pro-EU moods in Ukraine — meaning people who definitely want to join the EU, and are ready to argue as to exactly why (aside form just “better roads” and etc.) — are present, perhaps, in around 15% of people, and around the same percent of people can be viewed as being pro-Russian. The vast majority of the population is pro-Ukrainian, and supports this or that political party by looking not at their position on foreign policy, but on what that party will do with salaries, taxes, etc. Returning to the Maidan, there were, of course, many different factions present. To be more correct, there were many different factions who supported the Maidan. Yanukovych and his oligarchs were seen as anti-Ukrainian — people who sold out the country and also attacked the core values of the country. Many different forces opposed this. 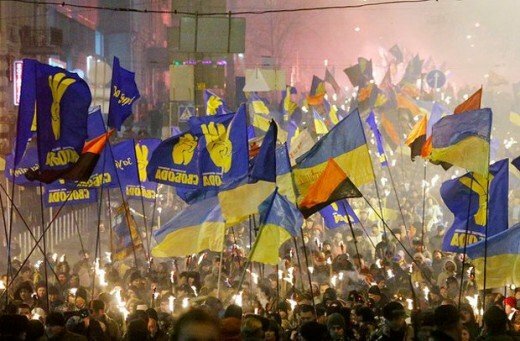 In Ukraine, the only group capable of easily gathering thousands of people for any protest are nationalists. Most liberal movements in Ukraine exist only on foreign grants and they are not capable of mounting protests; most Russian movements only exist on paper. Early on, nationalists decided to wholeheartedly support the protests against Yanukovych. In fact, in terms of capturing government buildings and fighting with police, the nationalists were undoubtedly at the forefront of this. From the very beginning, this gave the Maidan a very nationalistic and traditionalistic feel. Nationalists gave out numerous leaflets and gave numerous speeches. They reached audiences that they could only have dreamed of before. Many Western nationalists, such as Lauren Ozon from France and John Morgan of Arktos Publishing, also came to speak and were enthusiastically met by protestors. At the same time, Western agents in Ukraine saw the protests as an excellent opportunity to promote EU integration and the EU in general. They tried everything to turn the completely just hate of ordinary Ukrainians to love to the West and the EU. They had the media behind them, and also virtually every foreign language resource on the protests was formed by them. Despite their colossal efforts, nationalists still succeeded in giving the protests a completely Ukrainocentric feel. Anyone who speaks of substantial Western help in organizing the protests simply lives in an alternate universe. The Maidan was one of the best examples of self-organization amongst people in Ukrainian history. Be it bus drivers busing people for free from the provinces; to mid-sized entrepreneurs donating money to keep the stage running; to nearby restaurants providing free food for protestors, the entire protests were completely folk run. Largely with the help of nationalists, there were vertical command structures to maintain order. Special uniforms were given out depending on the situation, be it on the central square or inside buildings. The protesters were average people; for example, many were university students who were known for being youth leaders of nationalist movements. It should also be mentioned that, although the protests were centered in Kyiv, there was some unrest both in the East and in the West against the government. However, the vast majority of people, thought it much better to be bused into Kyiv than to protest in the provinces. The protesters were from all over the country; one only needs to look at identification of protestors killed to confirm this. It was not one side of the country against the other, but Ukrainians from East and West against the government. The atmosphere on the Maidan was also no less folk-oriented. One only needs to have been on the Maidan to understand this. Far from what might be seen on Western or Russian TV, at the beginning and end of every day, Orthodox priests stood on stage and said prayers, repeated by crowds; patriotic music and movies were played non-stop; crowds chanted nationalistic slogans after virtually every single speech — a far cry from meeting the anti-nationalism promoted by the EU. True, slogans like “Ukraine is Europe” were also present, but for many they too had patriotic undertones and were understood not in the sense of liberalism, but as being a part of Europe, not the USSR. Of course, one could say that this really means nothing, because it was not Orthodox nationalist priests who came to power. Yet it changed a population subconsciously, and made the ethnic, not political understanding of the nation widespread; it made even liberals pretend they love Ukraine and claim they want to build a Ukraine for Ukrainians. The Maidan was an explosion of civil consciousness that united Ukrainian patriotism with demands for economic and social justice. Many Western nationalists strongly criticized the Maidan because of the fact that neo-con warmonger John McCain spoke to protestors. This was clearly evidence, according to some, that the whole thing was just a large Western conspiracy. I must say, even for me it was quite unpleasant to see him on the Maidan. Unfortunately, notorious neocon Victoria Nuland also came for a day or two. Yet average people were protesting a corrupt, mafia-controlled government that promoted completely anti-Christian, anti-national policies at home — a government that sold the country out to international corporations and oligarchs. People were protesting for a better life and a better future. Anyone who came would have been supported by protestors — and believe me, there were no limits. In fact, the stage on the Maidan was open for anyone to speak and indeed thousands of different people spoke. So why did McCain come and why was he well received? I would change the question slightly. I would ask why was only John McCain smart enough to come and support the people? Where was Marine Le Pen? Where was Nick Griffin? Why didn’t they come? Why did no influential Western dissident, many of whom criticized the Maidan, tell the people on the Maidan his story? Even David Duke could have come and been well received. I repeat, that for the average Ukrainian, their presence would have been seen not from an ideological point of view, but as genuine support to an oppressed people fighting a tyrannical government — people essentially risking everything. To be quite honest, a member of the Russian government could also very well have spoken to the protestors and would have been well received. In fact, when one takes into account how much Yanukovych did to oppose Gazprom, I’m not quite sure why they didn’t. It would have massively increased Ukrainian public opinion of Russia. McCain likely came because of the intelligence that the American establishment unfortunately has. The American establishment knew that by sending someone well-known to support an oppressed people, they could immediately influence public opinion of America. And that is what happened. Although originally people saw visits by McCain et al. as a show of support, around January and February support for anything Western, including joining NATO or the EU, completely plummeted in Ukraine. For someone as against NATO and the EU as me, it was nothing short of a dream, albeit in horrible circumstances. People did not understand why the reaction from the West was so muted. Numerous anti-EU sites and anti-Western patriotic sites arose, and the average person mocked leading Western politicians, from Barack Obama to Jose Manuel Baroso with all of their heart. It was almost surreal how even most of the previously liberal Ukrainian media was joining in. A dream come true! Think for yourselves —what would happen if, in the center of Damascus, 500 000 people were protesting against the government and the government responded by shooting many like dogs? 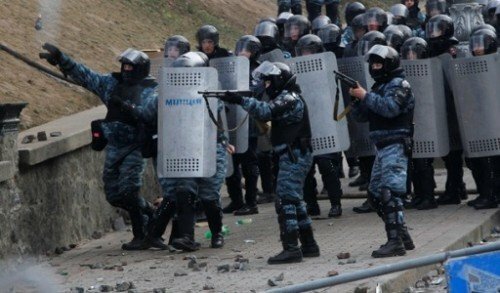 The Berkut unit, which just a few months earlier beat nationalists and Christians while defending homosexuals, this time shot protesters. Of course, there would immediately be crippling sanctions and the international community would in unison call for the government to step down. The reaction towards the Ukrainian government was quite the opposite. Not only were absolutely no real sanctions imposed, and, although there were calls for political concessions, there was not a single call for Yanukovych to step down, and many Western officials reiterated that Yanukovych is the lawful president of Ukraine and even said he is the one who has to lead Ukraine out of the crisis. Why do so many Western governments see Bashar Assad as not the lawful president of Syria, as a criminal who must be overthrown, but that was not the case with Yanukovych? What is the difference? How can anyone, after understanding this, view overthrowing Yanukovych as being even remotely similar to overthrowing Milosevic or the war against Assad? However, when the revolution succeeded, it seemed that a bright future was ahead: nationalists had an enormous amount of support in society; but most important was that society was mobilized around nationalists. The average person learned how to fight and wanted to fight. Nationalist slogans united with economic and social demands in a classic recipe that Europe first saw during the mid-half of the 20th century. Hundreds of thousands of angry people had anti-oligarch and largely anti-capitalist attitudes, combined with nationalist sentiments. And they were able to overthrow the government. These are people who lost all hope and trust in anything related to the EU or NATO. What could have been better? Surely, there would be a revolution? If not a revolution, then at least a Hezbollah-type force would be created in Ukraine — a state within a state based on cultural values and with mass support, a force that prepared for future resistance against the anti-national state? This all seemed very possible. Yet sadly, soon after, an event happened that changed everything.